Moscow, July 16, Interfax - Not only ordinary citizens, but Patriarch Pimen of Moscow and All Russia as well could not control emotions during the Moscow Olympic Games in 1980. 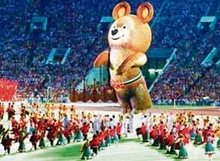 “His Holiness (Patriarch Pimen - IF) watched in binocular the show with the Olympic bear flying away. Though he was usually very austere and restrained in his praise, he said with wet eyes: “Worthy sight, worthy!” Rector of St. Nicholas Church in Tolmachy, spiritual father of the Russian Olympic Team Archpriest Nikolay Sokolov said in his interview with the Kultura paper on the threshold of the 35th anniversary of the Olympic Games-80. The priest then worked as Patriarch Pimen’s assistant and helped arrange a prayer room for Orthodox athletes in the Olympic village. “Not only Orthodox believers could pray at the chapel, but Christians of other confessions as well. Once I saw Protestants coming there. They sang a hymn and accompanied themselves in an electric organ, which I personally bought. I know that some western athletes prayed there,” he said.